Pezulu Tree House Lodge is a unique South Africa game lodge situated in the Guernsey Private Nature Reserve. Pezulu Tree House Lodge offers a unique Limpopo safari lodge experience. Accommodation is provided in 10 eco-friendly tree houses. 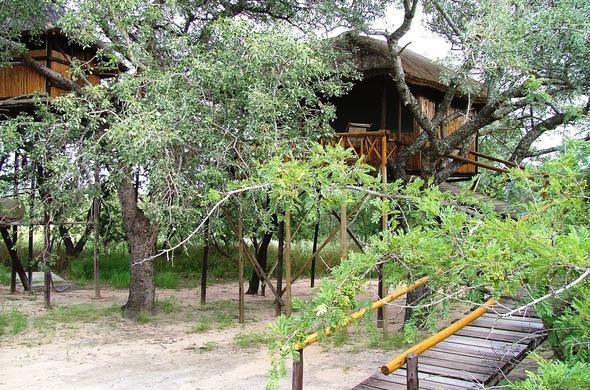 Each tree house features a spacious balcony from which you can spot African wildlife. Explore the Guernsey Private Nature Reserve with an exciting game drive. During the game drive, keep a lookout for Rhino, Zebra, Buffalo and Giraffe. The experienced guides are on hand to share their knowledge of the African bush. The Kruger National Park is ideal for a day trip. The Orpen Gate is conveniently situated only a 40 minute drive away. You can also enjoy the spectacular scenery of the Panorama Route. Visit the Blyde River Canyon, Bourke's Luck and the scenic town of Pilgrim's Rest.